On a multi-page survey, a progress bar is a great way to give users an idea of how close they are to finishing the survey, increasing your response rate. 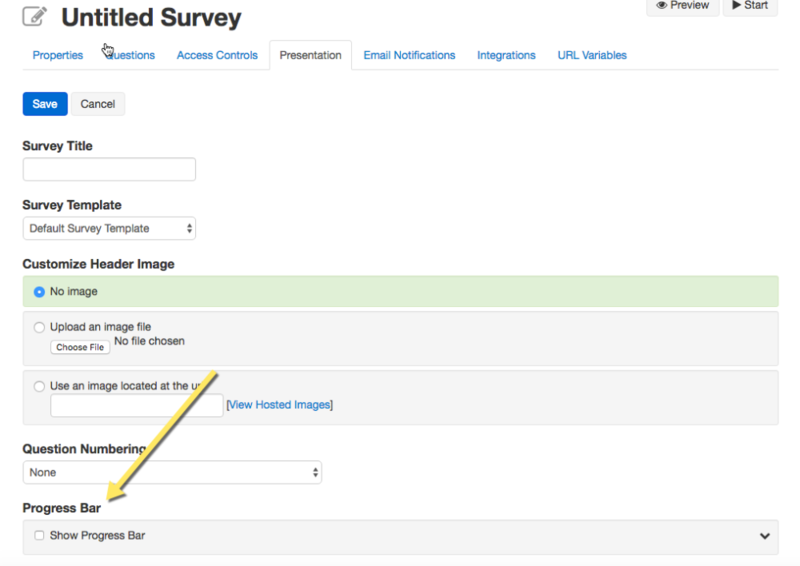 It's easy to add a progress bar to your survey and you have several options for its presentation. First when editing a survey go to the "Presentation" tab. Once you check the "Show Progress Bar" checkbox, you will have some options for how to present the bar. You have the option to add a survey bar at the top of your survey, at the bottom survey or both. You can also choose to add a "pages completed" and "percentage completed" to the survey bar. If chosen, the pages completed will be on the left and, if chosen, the percentage completed will be on the right. These are markers that give users a way of knowing how many pages are left in the survey. Note: On multipage surveys with skip logic and action, if you skip a page, the progress bar will simply jump along with it. For multi-page surveys, a progress bar is a great way to keep your respondents engaged until the end, keeping your responses rates high and your respondents engaged.